On August 21st, Maryjane Angelo of Skye’s Spirit Wildlife Rehabilitation in Pennsylvania received a call from a man who said his nephew was standing in the middle of a rural road, guarding a Bald Eagle. People who say they have found an eagle have rarely found an eagle. The bird usually turns out to be a hawk, vulture, exotic chicken, or sometimes a pigeon. But as Maryjane drove over the crest of a hill, she found five teenage boys waving and flashing their iPhones, all standing in a semicircle around an adult male Bald Eagle. The eagle was soaking wet from the rain, his feathers in disarray. As Maryjane put on her gloves and headed toward him, he tried to fly away, but couldn’t; instead he bolted off into the dark on foot. It took Maryjane a considerable distance to run him down and grab him, then she had the pleasure of lugging the 12-pound bird back to her car. Maryjane brought him back to her rehab center and gave him an exam. His foot and lower mandible were bloody, he had bruising down his neck and a small gash on one thigh, but she couldn’t find anything broken. She gave him pain medication, checked in with her veterinarian, then settled him into a hospital box for the night. The following morning, the vet’s x-ray showed nothing broken, and there was no sign of head trauma. He put a single suture into the eagle’s thigh, and sent him home. Once again, Maryjane settled him in; then, since he was banded, she went online to look up the band. It turned out that, believe it or not, the eagle had been banded on August 21, 1987 – 25 years to the day before his rescue. 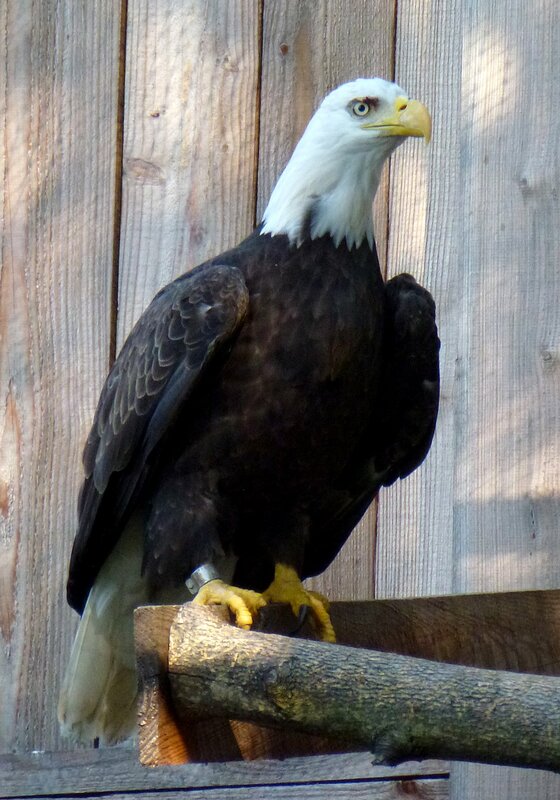 Further investigation revealed that 30 years ago, the Pennsylvania Game Commission had brought breeding eagles down from Canada to start a Bald Eagle re-introduction program, hoping to bolster the population ravaged by DDT. The program was successful, and the number of Pennsylvania eagles climbed. Maryjane’s was the only released fledgling they’d ever recovered. He soon moved into the big flight, and after two weeks, was flying perfectly and ready to go. Maryjane and her husband took him to The Glades, an environmental area near where he was found. A group gathered to send him off, including PA Game Commission’s Tracy Graziano, who took a beautiful video of the event, which I urge you to watch. In the video, you can see His Regal Grumpiness energetically bashing Maryjane in the head with his wing, while glaring at her as if to prove that he could easily bite her face off, if he so chose. She launches the eagle into the air, he spreads his wings, and sails off into the open sky. Ten minutes later he was still circling above them, soaring and swooping, and reveling in his freedom. Skye’s Spirit Wildlife Rehabilitation Center has just lost their primary source of donated raptor food, and they are scrambling to find the funds to pay for food for their birds. Please help! Donations are tax-deductible. Their work is so important, and money is so hard to come by these days. And do watch the video! A very touching story. I felt like I was there. What a magnificant bird and I want to be be one in my second life. Twenty five years is just unreal to have him around in todays enviroment. I don’t facebook at all, so how do you view the release of this eagle? Is it on you tube? Thanks, Jean, I’d like to come back as an eagle, too! And thanks Mike, for fixing website addresses and the photo! If you can’t view it, let me know and I’ll find a way. What a beautiful story for this 25 year old and for the wonderful help given in his rescue by the young men and to the rehabber!! Congratulations and thank you to all!! Just brings happy tears to my eyes. Beautifully written directly from one heart to ours!